Click to enlarge the chart of the number of movies and dramas that the Okinawa Film Office has helped from 2003 to August 31, 2012. 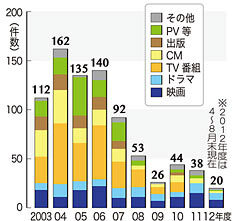 From 2003 to the end of August 2012, the Okinawa Film Office supported the filming of a total of 822 projects. This includes subsidizing the cost of the production of the Japanese-Canadian movie Karakara, which won the Public Award for the most popular Canadian feature film and the Openness to the World Award at the 36th Montreal World Film Festival. While the film office has achieved satisfactory results, it has still many problems to resolve. Overseas film crews face problems such as complicated procedures to get permission to shoot, and there is a lack of capable interpreters. The film office has supported 131 movies, 85 dramas, 245 television programs, 126 commercials, 67 publications such as books and magazines, 120 promotional videos and 48 other works. This includes eight foreign movies and dramas. In addition to Karakara, the Okinawa Film Office supported the filming of Nada Sousou, Dr. Koto’s Clinic 2006, and the Korean movie Ikemen desu ne. It supported more than 100 projects each year until 2006. Since 2008, it has narrowed down the scope of projects it supports because of pressure to reduce the Okinawa Prefectural Government’s budget, and because some people are starting to worry that the Okinawan private sector may be squeezed. Since 2011, the film office has specialized in supporting films and dramas. According to the office, while the number of projects it has supported has decreased, because the film crews stay longer, the direct economic benefit has grown. Since fiscal 2010, in order to attract foreign film crews the Okinawa Prefectural Government (OPG) has provided subsidy support for the overseas content business. The OPG assists with a portion of the production costs, and Kukuru Vision Inc., which produced Karakara, received a 10 million yen grant from the OPG. However, Okinawa is not ready to cope with large-scale overseas film crews. It needs larger numbers of interpreters and the various procedures for foreign film crews must be simplified. A staff member for the Okinawa Film Office pointed out that in addition to monetary assistance, they need a specific district or zone in which the proceedings to get permission of shooting are deregulated. They suggested that the OPG should also strengthen its efforts to support this project for industrial development, not only in order to promote tourism. The Okinawa Film Office is located within the Okinawa Convention & Visitors Bureau. It works on the coordination of proceedings of shooting for film crews and seeks to attract overseas movies and dramas.